April’s posting is a little earlier than usual because of something I received in the mail that I want to share with you. On Saturday, March 29th there will something called Earth Hour 2008. From 8 pm to 9 pm, people across the globe will turn off their lights as part of a global event to symbolize that each one of us, working together, can make a positive impact on climate change. Please go to www.earthhour.org to find out more and to make a personal pledge to reduce your own carbon footprint. This comes a few days before Earth Day, but it is a conscious way to kick off April and Earth Day on April 22nd. Earth Day/Global Warming is the main focus for April, wherever you look. However, I found a very interesting article on emissions in www.Earthsave.com, which can be found under Health Flashes/Special Reports. You may be surprised that CO2 is not as impactful as methane gas, the greatest source of which is from the meat industry. Please read at least the bold sections for some eye-opening information about global warming. I think all of us have to practice conscious living evry day of our lives, not just Earth Day. In looking through my files, I came across lists of how we can save our planet from human destruction. Basically, there variations of the 3 Rs: Reduce, Reuse, & Recycle. But the article by Arthur Baral, a man I met many years ago at a Vegetarian conference, puts another spin on Earth Day that I think you might find interesting. Check This ‘n That for his thoughts that might help you see the link between our bodies and the body of Mother Earth. Both the articles about Earth Day are fairly long for my website, so you may want to break up reading this month’s postings in more than one setting. It’s just that Earth Day has become such an important event and the two articles are not ones you would find in mainstream magazines, so I wanted to post them in their entirety. Finally, the photos this month are taken from various places, including our trip out West last summer. The sunrise above I captured one cold morning outside my patio door in mid-March. It was so glorious that I once again marveled at Mother Nature’s bounty and beauty. 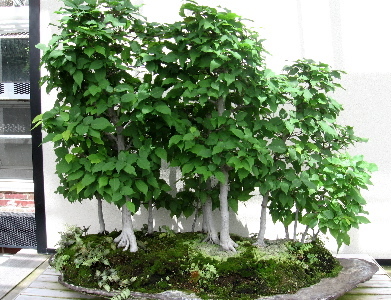 Enjoy early Spring and make at least one important environmental change in your daily life that will help guarantee that Spring will come again and again and again…..
Spring in miniature–a bonsai at Longwood Gardens. You are currently browsing the Menupause weblog archives for April, 2008. All information ©2006 Ellen Sue Spicer. All rights reserved.